James Booker's stature in New Orleans musical history can be gauged by the nicknames bestowed on the gifted, troubled, openly gay musician: the Bayou Maharajah, the Piano Pope, the Ivory Emperor, and the Piano Prince of New Orleans. Among the many magnificent gifts the city of New Orleans has given American culture is a school of piano playing going back to Jelly Roll Morton and on through such keyboard eminences as Tuts Washington, Champion Jack Dupree, Henry “Professor Longhair” Bird, Huey “Piano” Smith, Allen Toussaint, Mac “Dr. John” Rebennack, and Henry Butler. Crescent City piano tradition melds the blues, jazz, stride, and ragtime with what Morton famously but inaccurately called “the Spanish tinge” -- they are actually Cuban dance forms, like rumba and the habanera. And then there’s James Booker, whose stature in NOLA musical history can be gauged by the various nicknames bestowed on the gifted, troubled, openly gay musician: the Bayou Maharajah (the title of a new documentary film about the pianist), the Piano Pope, the Ivory Emperor, the Piano Prince of New Orleans. Booker himself coined at least one of these monikers -- the Bronze Liberace. Dr. John, who learned from Booker and later hired him for his band, called him “the best black, gay, one-eyed junkie piano genius New Orleans has ever produced." (Booker claimed to have lost his left eye in a brawl with a former bodyguard to Ringo Starr. He affixed a star to his eye patch to remind people whom he believed was responsible for his injury.) Booker was uncommonly versatile. Not only was he a master of blues and jazz; he also had serious classical chops. After hearing the 18-year-old Booker play in New Orleans, the classical piano virtuoso Arthur Rubinstein expressed astonishment: “I could never play that... never at that tempo." The son and grandson of Baptist preachers who were pianists, Booker made his recording debut in 1954 with “Doin' the Hambone” and “Thinkin’ ‘Bout My Baby”. These sides, cut for Imperial Records, led to session work with Fats Domino, Smiley Lewis, and Lloyd Price. Booker released a few more singles before enrolling at Southern University's music department. In 1960, he had a minor pop hit, and a major R&B chart success, with “Gonzo”. He had a few more fairly successful records until he was sentenced to serve time in Louisiana’s notorious Angola Prison for narcotics possession. Booker released only two studio albums during his lifetime. (He also issued several live albums, and his work appears on numerous compilations.) Classified: Remixed and Expanded is a new and enhanced version of a recording made in 1982, with 22 tracks, ten more than on the original release. Backing the pianist on most selections are tenor saxophonist Alvin “Red” Tyler, one of New Orleans’ leading session players; bassist James Singleton; and drummer John Vidacovich. The album includes two solo piano pieces, the Lloyd Price hit, “Lawdy Miss Clawdy” and “If You’re Lonely”, as well as nine other previously unreleased numbers. Booker had wide-ranging taste in material, and Classified: Remixed and Expanded gives full scope to his eclecticism: funky New Orleans rhythm and blues (“All Around the World”), jazz standards (“Angel Eyes”), blues (“Lonely Avenue”), film music (“Madame X” and a syncopated version of Nino Rota’s “Theme from The Godfather"), light classical (an excerpt from “The Warsaw Concerto”), and pop (Roger Miller’s ode to the vagabond life, “King of the Road”). But no matter what he’s playing, Booker imparts astonishing musicianship -- and humor, eccentricity, and soulfulness -- to everything he touches. With his left hand he lays down syncopated bass lines; with his right he unfurls flowing rolls and flourishes. Booker also played the Hammond B3 organ -- his debut “Gonzo” was an organ instrumental -- and although this reviewer certainly prefers his piano, it’s impossible to resist his groovalicious take on “Yessir, That’s My Baby”, played on the Hammond, an instrumental performance until Booker sings a few bars of the old chestnut towards the end. As a singer, Booker wasn’t one of New Orleans’ great voices; his voice was reedy and at times unsteady. He made the most of his limited vocal chops, though, as is evident on the deeply soulful “If You’re Lonely” and “You Ain’t Nothin’ But a Hound Dog”, where Booker will make you forget both Big Mama Thornton and Elvis. But of course it’s Booker’s piano genius that made and secured his reputation, and Classified: Remixed and Expanded offers a generous serving of it, from his gorgeous reading of “Angel Eyes”, inspired by Frank Sinatra’s indelible version, to the rollicking medley of “Tico Tico /Papa Was A Rascal / So Swell When You're Well” to his medley of two of Professor Longhair’s most famous pieces, “Tipitina” and “Bald Head”. The pianist known affectionately as “Fess” was a major influence on Booker (as he was on so many New Orleans pianists, from the late 1940s to the present) and Booker does his hero proud, albeit in his own way, playing “Tipitina” as a bluesy ballad, punctuated with well-placed hesitations and fluid rolls. Booker’s instrumental version of Doc Pomus’ “Lonely Avenue” and his own composition “I’m Not Saying” are showcases for his inventiveness, harmonic sophistication, and deep blues feeling, with the latter, a jazz-blues fusion, particularly impressive. 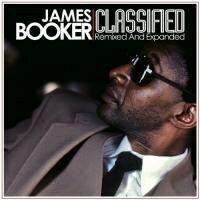 The title track, “Classified”, a Booker composition, dazzles with its extended intro; meanwhile, Booker’s instrumental take on “All These Things”, written by Allen Toussaint for another NOLA favorite son, singer Art Neville, is so full of feeling that its composer’s romantic lyrics would’ve been superfluous. James Booker died in November 1983, just a year after cutting the tracks that comprise Classified: Remixed and Expanded, succumbing to kidney failure while awaiting medical attention in the emergency room at New Orleans' Charity Hospital. Though beloved by fans (mostly in Europe, where he was acclaimed and felt less burdened by racism and homophobia) and other musicians, he never enjoyed fame and success commensurate with his talent. Rounder Records’ release of the remixed and expanded Classified, along with filmmaker Lily Keber’s documentary -- whose full title is Bayou Maharajah: The Tragic Genius of James Booker -- should bring some long overdue recognition to this great American original, the Bronze Liberace, the Piano Prince of New Orleans.